I swapped out my winter tires this morning and had a heck of a time removing the alloy wheels. I had to kick the you-know-what out of them to get them to release. Apparently, a ring of rust binds the alloys to the steel hubs. Since I wanted to put some miles on the wheels before I re-torque the lugs, I drove to my dealership and asked the tire guy why this happens and how I can prevent it. We've never heard of that happening, he said. I told him it's happened to me twice and he still didn't have an answer. Well, I stopped at the local tire shop near my home and the guy said it's very common and it usually takes his techs an extra 10-15 minutes per wheel to remove the wheel, grind the rust off the wheel and apply a anti-seize paste. I'm curious why the guy at Ford would not tell me that. Is it because they are instructed to never admit that something is wrong or could go wrong??? First: Alloy wheels don't rust. Second: Do NOT GRIND on them with anything. Third: Do NOT apply anti seize to them. with a wire brush. Use some trans fluid on the flat mating surfaces and on the lug nut/stud threads. This will prevent corrosion from the elements as well as the corrosion from dissimilar metals. caused by anti seize. You could use anti seize on the studs, but not on the mating surfaces. Really, non iron alloys don't rust. Huh, who knew. Edited by timwil56, 28 November 2015 - 05:13 PM. There is nothing wrong with placing a thin coat of anti-seize on the hub ring that the wheel fits over. I have done that for years, and never had a wheel stick, nor ever had any problems with the anti-seize transferring to the brakes or any where else. Alloy or aluminum wheels will get stuck because of the dissimilar metals used in the wheels and the iron hub. People who drive where salt or salt brine is applied to the roads during winter will really see the results of the two different metals joining together. 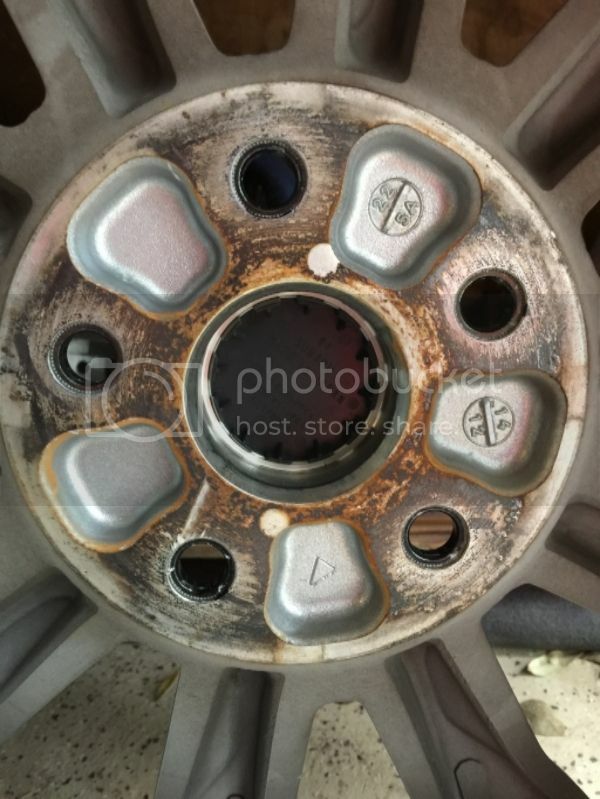 It may not be rust as such as opposed to the chemical reaction which leaves a white residue that binds between the hub ring, but it still causes the wheel to stick. You also never really want to add any kind of a lubricant to the wheel studs if the lug nuts have to be applied to a specific torque. Lubricant will affect the torque that is applied. Now with our cars that call for around 100 ft lbs with a plus and minus factor, the lubricant may not really cause that much of a problem, but it does have an affect. Edited by ls973800, 28 November 2015 - 06:37 PM. A copper/graphite anti-seize compound works great on metals of differing compounds mated together like this application. I use the moly-lith anti-seize compound on my motorcycle exhaust pipes when I need to remove them to get to the rear tire. Because of the forecast of very little snow and warm temperatures (30's-40's) continuing for at least two weeks, I re-installed my alloy wheels yesterday. Also, I'm driving to AZ on Jan. 14, so I would have done this anyway. Before installing, I wire brushed the contact points on the inside of the wheels and wire brushed and wiped off as much surface rust from the hub as I could. I then put a moderate amount of copper anti seize paste on the contact points on the inside of the rims. I'm confident it will not be an issue getting on the brake disk and will hopefully solve the seizing of the two dissimilar metals. I just so happen to rotate the wheels on the wife's Outback this weekend and noticed only one showed signs of rust and needed a slight pop with my fist to break loose; the others were OK. Interesting. The rust might be from the rotor :). When I changed my wheels and tires they were a major pain to get off! I have never struggled with any car as much as my CMAX.